When we think of the picture-perfect, or rather, sitcom-perfect couples we always have the love-birds Marshmallow and Lilypad from the show HIMYM on the top. When we think of the picture-perfect, or rather, sitcom-perfect couples we always have the love-birds Marshmallow and Lilypad from the show How I Met Your Mother on the top of our list. After all the ups and downs that they have been through, they still stand erect to be the legendary couple that everybody looks up to. Not just the mundane and mainstream honey, baby and the like, they call each other as Marshmallow and Lilypad. They have a unique set of names and they are so cute that they can never cross the line and get cheesy! If one of them get pissed off by a friend, they both get pissed off. If one doesn’t like a person, they both don’t like that person. Sometimes Marshall needs a push, but he always gets there with Lily. The crazy love and the rare fights makes them to be the most captivating couple of the TV series. Being high-school sweethearts, they never let the fire in their bellies die with the lapses of time. How better does it get? They fall in love more and more each day. The pillow talk, as you might put it, is something that they take seriously. Not only do they deliberately want to tell what happened all day, but they want to listen what happened with their other half too. They don’t have a single ‘no questions asked’ with each other. That’s an art of relationship that they excel in. No matter how rarely they fight or no matter how serious the fight might get, they have this untainted custom where they make use of pause in between the fights to make sure they are heading the right way and to make sure that they don’t disrupt their love for each other. Be it Lily’s love for art or be it Marshal’s dream to become a Judge, they accept each other’s dreams and even on the darkest of the days, they never give up on each other. Not one, but both of them are obsessive about double dating other couples. So much that they prepare lavish cuisines, write songs and click pictures to woo other couples to befriend them. With a no complains and no demands attitude, they not only accept, but they fall in love with each other’s imperfections. The sweet and sugary rituals are not only to express their love, but also to shower each other with equal affection. Whenever anyone leaves for a trip, he/she brings a six-pack of beer from that location while the other welcomes by wearing a chauffeur hat to meet at the airport. They always call each other during the lunch time while they’re working at their respective offices, to tell what they are having and to say mandatory ‘I love you’ to each other. More than following their rituals like a rule, they want to make the love stay alive by their little and sweet traditions. After years of marrying each other, they realized that they are growing older and they can no longer keep in track with their wedding vows which were ‘too perfect to be real’. So they make the new wedding vows which were more realistic and truthful. From donning the matching costumes to winning these contests, they are in this together and they keep themselves in the loop of love and never tend to get out of it. 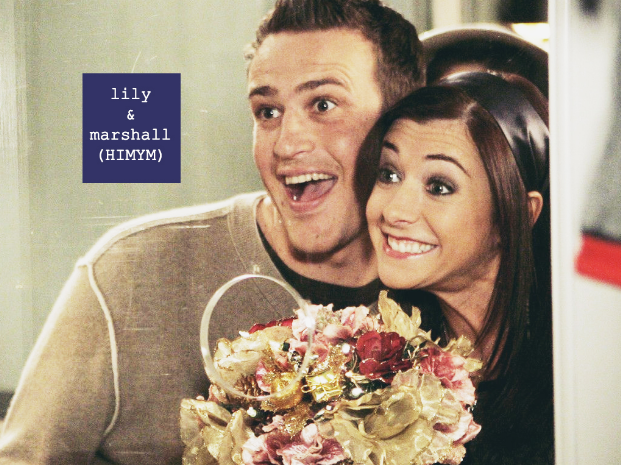 So have you found a love like Marshall and Lily yet?